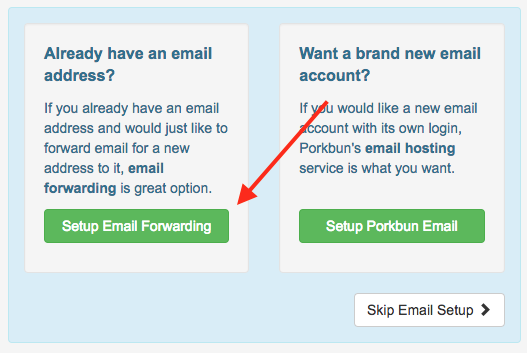 Porkbun offers two ways to make a custom email address for your domain: email forwards and hosted email. Email forwards are free, but your replies will show as having been sent from your personal email address. If you also want to send replies from your custom email address, you'll need to purchase a hosted email mailbox from Porkbun. 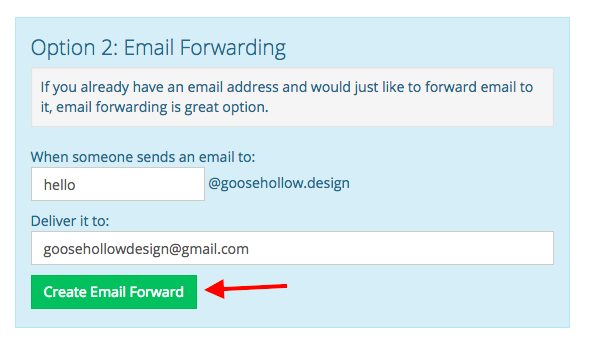 Identify the domain you wish to add an email forward to and click the envelope icon next to that name. It will appear grey if you’ve never set up email for the domain. Now, specify the name of your email address (what shows to the left of the “@”). Depending on the purpose of the email address, it could be your name, an employee’s name, or something like info, help, reservations, etc. If you wish to send a test email to the forward you created, make sure it is from an address different from the one you are forwarding to. This will prevent a "feedback loop" affect. Congratulations! You are now the owner of one very unique email address automatically forwarded to your existing account. You can repeat this process to create up to 10 active email forwards.